Have you ever wanted to leave the camera bag home and just venture out with your camera? But, the thought of having a camera swinging from your neck forces you to bring the camera bag anyway? Well, the B-Grip is your solution! I was wandering around Adorama last week and I found their newest exclusive item called the B-Grip. Designed in Italy, this camera holster loops through your belt to securely carry almost 18 pounds of camera weight! The holster design extends 6 inches down your leg to spread the camera weight over your hip. And, there are several other design touches that make it a winner. I love the quick-release system with a BIG lever for quick access. Even the quick-release plate was designed for convenience with a turn-screw built right in. The B-Grip even includes an all-weather cover to protect the camera while out in the elements and a safety-clip to further secure your camera. I spent some time this weekend using the B-Grip. Instead of looping it through my pant’s belt, I found it quicker and more comfortable to add a second belt just for the B-Grip. This method allowed me to wear the B-Grip lower on my hip to comfortable carry the weight of the Canon 7D, BG-E7 Battery Grip and 70-200mm f/2.8 IS L. I could easily see using the B-Grip to keep a second camera at the ready instead of buried in my camera bag. The instructional video even shows how to use the B-Grip to hold the camera while you switch lenses. Very clever! NOTE: B-Grip will work with belts 1/4 inch thick or less and the sturdy composite plastic will not give to force a thick belt through. I could not use a woven leather belt with the B-Grip (too thick), but a plain leather or woven camera strap will work fine. The B-Grip is an Adorama exclusive. Just got my Adorama email and this product was featured. I’m intrigued. Does the long base distribute the weight enough where you don’t feel any pressure points on your leg? I’m not built like either of the people used in the video so it’s hard for me to judge how it will fit me. Well, like I said in the review, the B-Grip extends 6 inches down to distribute the weight. I found that by wearing a separate belt just for the B-Grip, you could where it lower on your hip to make it more comfortable for extended use. Does that help? Can it handle a DSLR with battery grip?? Yes, I used it with the Canon 7D with BG-E7 Battery grip. Cost $74.99 on Adorama web site as well as Amazon not the $49.95 shown on this page. I’m having trouble finding tri-pod head for my slik 700 b-grip says it fits standard DQ-20 quick release head but it doesn’t ? Any advise? 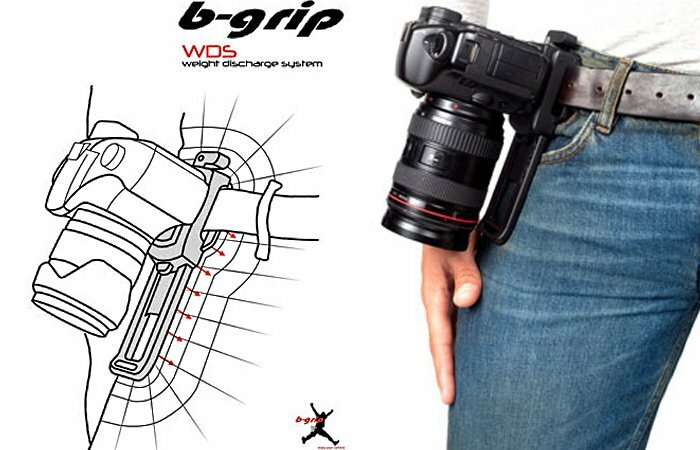 Well, the B-grip in the article is not a Slik tripod head; it’s a belt holster. You can purchase an extra quick release plate for it as well. I believe that you are looking for a circular quick release plate for the Slik 700DX. Adorama carries the quick release plate in two styles: the Slik Quick Release Plate for 700DX (standard) and the Slik Quick Release Plate for 700DX w/ 3/8 thread. Adorama also has the Slik DQ-20 but it is currently on back order.